A Windows Sidebar Gadget. The (Blister)CPU Gadget monitors your computer's processor and is highly stylable, even statically skinnable. Use the Settings panel to mix and match from dozens of included skins. Creating your own custom skins is as easy as dragging your images onto the Settings panel. Flyout, shown on click, displays additional information. Running Windows Sidebar as Administrator or with UAC disabled allows additional functionality of Flyout. oesn't show my CPU usage, but it looks good and the flyouts work. The one for skins works fine...the other shows 0 for all. These gadgets have run flawlessly for most, but thanks, boss0190, for reporting your experience. It sounds like you are still running with UAC enabled! I think you will find that you want to disable this eventually. One way is to Right Click Desktop -> select Personalize. In the panel that opens up, type in the Search box "uac" and hit enter. A panel should come up where you can uncheck a box, then reboot. If you do not wish to disable UAC entirely, you can also still get these meters working on your setup by running just Windows Sidebar as an Administrator. Exit your current instance of sidebar. Explore to Program Files/Windows Sidebar. Right Click on the executable and select Run As Administrator then answer a question on the next panel that pops up. If that seems like a pain in the neck, you'll get my drift about eventually disabling UAC! It is also possible to create a shortcut to Sidebar, Right Click it, Select Properties->Advanced->Run As Administrator. Which will still pop up one panel if UAC is enabled. A themeable gadget.. Excellent. Will use when my copy of Vista arrives. what about dual core? nice gadget anyways. would be nice to combine ram and cpu into one. takes up less space and I have more for other cool gadgets. That is a good question, tgd! I don't really understand the "why" of much of UAC functionality. This is the reason I turned it off, personally. I realize that my gadgets may be many people's first encounter with undesired UAC behavior, but I doubt it will be their last. I love Vista, but I just don't personally get the UAC, and can't stand the intrusive pop-ups and other inconsistencies like having to run apps as administrator if you want certain settings to save. That is little help to those who wish to keep UAC on, though. First, those gadgets by SFKilla you linked, and his others, are great. Anyone interested in gadgets, or who wants a meter that doesn't trigger UAC should give them a look. But, that said, they are different than mine. In fact, for two gadgets with such seemingly similar functionality, they could not be much more different underneath. And the specific difference, I believe right now, that makes my gadgets require more access, is in what information is displayed and how that information is accessed. 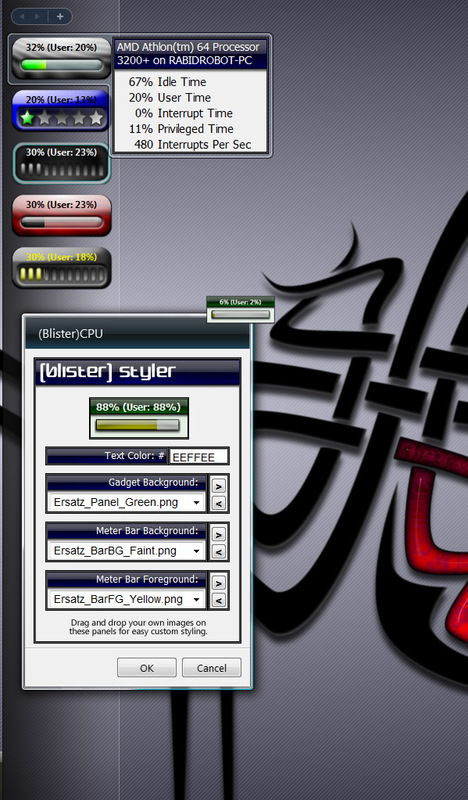 Essentially, SFKilla's gadgets use built in tools of Windows Sidebar to get a sub-set of information about the Processor(s) or RAM. I use direct access to the Windows Management Instrumentation, which gives me a bit more control over what information I retrieve and how that is achieved. For example, access to the information in the (Blister)CPU Gadget Flyout Panel (see screenshot) is not available through the standard Gadget API, only through WMI. I think this is why my scripts and gadgets require greater access. From boss0190's original description, and in my subsequent testing, I have found that only the WMI dependent sections of the scripts are failing when UAC is activated (So you can change the skins, but the meter doesn't update). I personally encourage anyone interested or concerned to examine my gadget's scripts, and welcome suggestions for streamlining ease of use for those with UAC activated. But I will stick with using the WMI, because it is so versatile, I know it, and sometimes it is the only thing one can use! Thanks everyone for your interest and comments!! thank you for the detailed explanation. I am always learning. hopefully there will be a way around this with your script in the future. I hope to find a better solution too. I'm looking for way to at least know if UAC is obnoxiously, silently killing my scripts, so I can tell users what is happening. If there is access to UAC via script it isn't well documented yet! But you have a very good point, and I'll continue to investigate what I can do--as a Gadget designer--to make this easier and clearer. I also just wanted to point out that I'm not doing some nefarious, off-the-wall scripting. Scripting and Gadgets and WMI go hand in hand in...er, uh, hand. Indeed, my gadgets are in essence very similar to the gadget described in this (outdated obviously!) Microsoft Gadget Scripting Tutorial. 1) How do you install/add these ".gadget" files? 2) Where are they located after they are added/installed? Well... reading about the UAC stuff here - other programs do the exact same thing as yours without running afoul of UAC. I'm not disabling UAC, so I guess I'll pass on your program. Hey Lotherius, as the description states this gadget is Compatible with UAC. Not to mention you will not, at this time, find other gadgets which have the additional functionality provided in my flyout, or flyouts at all for that matter. Say robot have you tried editing the properties for the sidebar.exe program itself and adding the control for the user [must add user]to the admin startup for this program as with other gadgets also. This is how other programs are over coming the uac controls. They just write in a set of user properties for the program to the propeties. Kind of hard to put into words of why it is good to have uac with all the negitive feed back. But there is a right way of doing things with Vista and all the security features it provides! Hope you can see my point and figure more on the line of how to include rights for properties being written for said program to run as admin in the install of said program. Yeah I changed my opinion on UAC, one reason being if I am going to develop gadgets, etc. for folks I should make them UAC friendly from the start. I don't mind it so much now that I've learned more about it and how to use it. These work fine with UAC enabled, with some limited functionality but seamlessly implemented. I usually restart the sidebar from a special shortcut set to launch as administrator to expose the additional functions. There are gadgets that use compiled components to get a bigger sandbox, and they work great but not so easy to create. I've played with setting properties on the executable but ran into trouble starting up...maybe I didn't get them quite right. It would be weird if a gadget which normally would have some restrictions would be able to rewrite a setting to give sidebar.exe and therefore itself a higher priority, compiled or from script...I'll have to look into that, thanks!